Gary Lee Eiffler, 63, passed away on Tuesday, January 29, 2019 at the Evans Memorial Home in Cresco, IA. Gary was born on December 19, 1955 at his home in Lime Springs, the third child of Melvin and Lenora (Sanborn) Eiffler. Due to his mother’s illness and inability to care for Gary and his sisters, the children were later placed in foster care in Johnson County, IA. 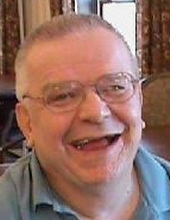 Gary spent most of his adult life as a resident of care centers including the Clarion, IA unit of North Central Human Services, Howard County Residential Care Facility, and finally at Evans Memorial Home in July 2002. There he received the tender loving care of the staff for 16-plus years. At the Evans Memorial Home, he was also reunited with his mother and sister, Alice, who were also residents. Together again, they enjoyed watching the birds in the aviary and the companionship of staff and residents. Gary was an avid Hawkeye fan, especially football, and was active in most events at Evans. Gary was preceded in death by his parents, Lenora on November 19, 2001, and Melvin on May 8, 1999. He was also preceded by his sisters, Alice Mae on June 29, 2004, and Joyce Marie (Eiffler) Thoren on September 14, 1981, maternal grandparents Winfield and Agnes (Cleveland) Sanborn, uncle Lloyd Peter and aunt Barbara Mollert. Gary is survived by a half-sister, Patricia Waite Betten of Seattle, WA, aunt Marian Peter of Cresco, IA, uncle Charles Mollert of St. Charles, MN, and several cousins. To send flowers or a remembrance gift to the family of Gary L Eiffler, please visit our Tribute Store. "Email Address" would like to share the life celebration of Gary L Eiffler. Click on the "link" to go to share a favorite memory or leave a condolence message for the family.